Luxurious 3 Bedroom Villa With Private Heated Pool, In The South Of Tenerife - Callao Salvaje. 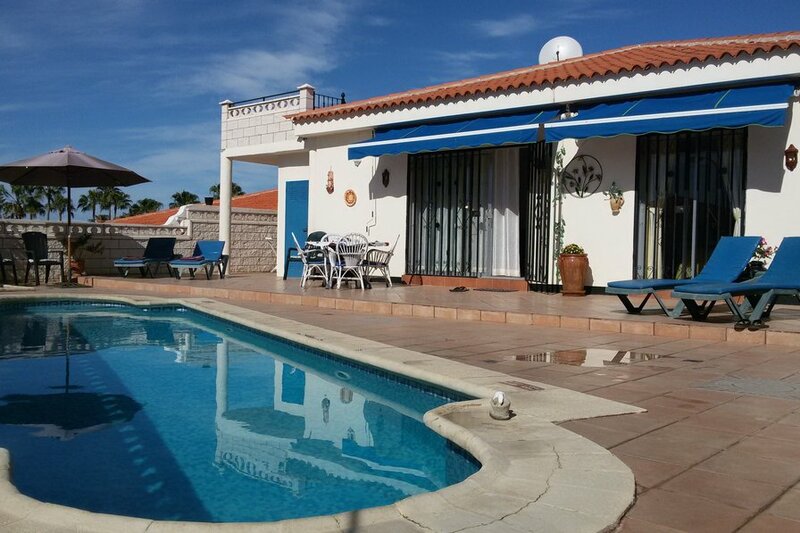 Detached 3-bedroom Villa with its private HEATED pool and large pool-terrace with a shower. Also, there is a spacious terrace over the roof, solarium, with great and breathtaking views of the Ocean, La Gomera Island, and Mount Teide. Total area, with the terrace and swimming pool - around 300 square meters, villa´s size is 120 sq m.
This villa has been upgraded to an excellent standard, and it is situated on one of the larger plots of the Urbanization. Holidaymakers return year after year and no wonder, this Villa has everything to make your stay in Tenerife so memorable. Relax in comfort in the lovely lounge area looking out over the private pool and sun terrace. With stunning sea views from the pool area looking out to the neighbouring Island of La Gomera, you soon realise what a beautiful Island Tenerife is. There is a covered terrace for when shade is required and roof terrace providing fantastic views of sea and mountain. There is a BBQ and ample patio furniture for sunbathing or alfresco dining. Internally the villa is fully equipped with fans in all rooms. Located in the south of the island, in the popular town of Callao Salvaje, 25 km from the international airport and approximately 10 km from Playa de Las Americas. About 700 meters the new sandy beach, equipped with sunbeds, umbrellas and hammocks. The villa consists of a spacious and luminous living room with dining area, kitchen, equipped with everything you might need, three bedrooms, two bathrooms, and 2 parking places. Designed for comfortable accommodation of up to 6 people. Master double bedroom with fitted wardrobes, bedside tables dressing table, mirror and fan. Patio doors leading to pool area. Bedroom 2 twin beds, fitted wardrobes, bedside table, mirror and fan. Bedroom 3 single bed with full size pull out bed. En-suite to bedroom 1 fully modernised, bath, overhead shower, bidet, hand basin and mirror, WC and hairdryer. Shower room, enclosed shower cubicle, WC, hand basin, mirror, hairdryer and washing machine. This modern kitchen with granite work surfaces is equipped with halogen hob, oven, extractor canopy, microwave, coffee maker, electric juicer, kettle, toaster, fridge/freezer, dishwasher, iron, ironing board. There is ample crockery and cutlery. Lounge/diner with two leather sofas, dining table 6 chairs, ceiling fan, feature wall unit and matching mirror, coffee table, Flat screen TV with UK & European Satellite Channels, DVD, CD/Radio. A selection of books and games. Patio doors looking out to the pool and terrace. Barbecue, Pool Heating, Private Pool. Cot, High Chair, Room Fans, Satellite Dish. From the living room you can go to a large terrace where you can sunbathe and swim in the spacious pool. This villa has a great corner location, that allows you to get in directly, through separate entrance, from the parking lot. Due to the large corner plot this Villa has a roof terrace with views of the sea, mount Teide, and the Island of La Gomera. A covered terrace when shade is needed and a large open terrace around the private Roman style pool which is heated during the winter months. The pool is accessible by steps and the depth is 1m to 1.5m it is 9m long and 3.2m wide. There is a cast iron BBQ for alfresco dining with ample sun loungers patio table and chairs. On hidden from prying eyes terrace, there is a private pool and a cozy garden, a BBQ area with a magnificent view of the Ocean and the neighboring island of La Gomera. Here, in an atmosphere of tranquility and privacy, you will be able to sunbathe under the warm Canarian sun, have a deep dive in the pool, cook delicious kebabs or Canarian-styled rabbit (Conejo al Salmorejo), or simply enjoy the beautiful Tenerife's climate. NEIGHBORING, NEXT DOOR VILLA, IS ALSO AVAILABLE FOR RENT FROM US, WHICH IS VERY CONVINIENT FOR BIG GROUPS OR SEVERAL FAMILIES PARTIES, OF 10 TO 12 PEOPLE, WHO WANT TO STAY NEXT TO EACH OTHER. Just 200 meters away from the commercial center, where there are: a few bars and restaurants, a supermarket, several shops, 2 Banks, dry cleaning and a health center, a tennis court, beauty salon and hairdresser. An ideal place for quiet and peaceful holidays´ lovers, away from the noisy and never sleeping "youth" quarters of the island. This Villa is equipped with everything you might need, for a luxurious and placid holiday. Tranquility and quietness throughout the Complex. 2 . Not too hot in the summer, fresh and clear air through the year. 3 . Good and reliable neighborhood, majority of neighborhood - are European residents. 4 . Security: metal protective bars over the windows & doors, Security Service from the Municipality. 5 . Your own mailbox and the opportunity to register (empadronarse), and get a Social Security number at this address. Convenient location and proximity to both the Ocean and beach activities, and the Canary towns and entertainments. Easy to get anywhere in the island, using Public Buses.